Foreign Direct Investment (FDI): Foreign direct investment (FDI) is a direct investment into production or business in a country by an individual or company of another country, either by buying a company in the target country or by expanding operations of an existing business in that country. Foreign direct investment is in contrast to portfolio investment which is a passive investment in the securities of another country such as stocks and bonds. Foreign Exchange Regulation Act (FERA): The Foreign Exchange Regulation Act (FERA) was legislation passed by the Indian Parliament in 1973 by the government of Indira Gandhi and came into force with effect from January 1, 1974. FERA imposed stringent regulations on certain kinds of payments, the dealings in foreign exchange and securities and the transactions which had an indirect impact on the foreign exchange and the import and export of currency. The bill was formulated with the aim of regulating payments and foreign exchange. Foreign Exchange Management Act (FEMA): The Foreign Exchange Management Act (FEMA) is a 1999 Indian law "to consolidate and amend the law relating to foreign exchange with the objective of facilitating external trade and payments and for promoting the orderly development and maintenance of foreign exchange market in India". It was passed in the winter session of Parliament in 1999, replacing the Foreign Exchange Regulation Act (FERA). This act seeks to make offenses related to foreign exchange civil offenses. It extends to the whole of India., replacing FERA, which had become incompatible with the proliberalisation policies of the Government of India. It enabled a new foreign exchange management regime consistent with the emerging framework of the World Trade Organisation (WTO). It is another matter that the enactment of FEMA also brought with it the Prevention of Money Laundering Act of 2002, which came into effect from 1 July 2005. Unlike other laws where everything is permitted unless specifically prohibited, under this act everything was prohibited unless specifically permitted. Hence the tenor and tone of the Act was very drastic. It required imprisonment even for minor offences. Under FERA a person was presumed guilty unless he proved himself innocent, whereas under other laws a person is presumed innocent unless he is proven guilty. Foreign Investment Promotion Board (FIPB): The Foreign Investment Promotion Board (FIPB) is a national agency of Government of India, with the remit to consider and recommend foreign direct investment (FDI) which does not come under the automatic route. It provides a single window clearance for proposals on FDI in India. Foreign Investment Implementation Authority (FIIA): Government of India has set up the Foreign Investment Implementation Authority (FIIA) to facilitate quick translation of Foreign Direct Investment (FDI) approvals into implementation, to provide a pro-active one stop after care service to foreign investors by helping them obtain necessary approvals, sort out operational problems and meet with various Government agencies to find solution to their problems. Most important thing post 1991 reforms is the permission given to private capital flow in the form of foreign direct investment (FDI). ⇒ It increases the efficiency of the market concerned. ⇒ It acts as a source of foreign exchange & helps to reduce the pressure on the Balance of Payments (BoP). ⇒ India adopted pro-FDI approach since 1990’s. ⇒ Successive governments from that time realized the importance of FDI & they were too pro-FDI. ⇒ Recent reforms such as FDI in retail, insurance, civil aviation, etc. are welcome steps & will surely help to improve these sectors in the coming years. ⇒ India has been focusing more on FDI these days so that it can decrease the pressure of Current Account Deficit. ⇒ It has been proposed that in long run FDI is never useful because of the diminishing returns to capital over time. ⇒ But it is also true that FDI increases the production & efficiency. So actually it contributed to increasing returns to capital. ⇒ According to the economic theories, there are four main channels of technological spillovers (indirect effect of FDI) from FDI to the host country (the country in which FDI comes):- 1) Learning by doing 2) Competition 3) Labour Skills 4) Linkage. ⇒ Any FDI provides for more new investment opportunities for local firms and increase their profitability through the provision of machinery, technology, training, managerial skill, and finance. ⇒ FDI also indirectly increases the local demand for local inputs such as labour and suppliers create local demand of domestically produced goods and services. This increases domestic investment (DI). So there is complementary relationship between FDI & DI. ⇒ FDI integrates local domestic markets with international ones & provides easy access to international markets for domestic business. ⇒ In a way it can be said that FDI contributes to improving the host economy’s export and competitiveness and volume by (1) augmenting domestic capital for exports (2)helping transfer of technology and new products for exports (3) facilitating access to new and large foreign markets (4) providing training for the local workforce and upgrading technical and management skills. ⇒ Till 1990 all the FDI norms were meant to meet domestic requirements. ⇒ It was the Balance of Payment (BoP) crisis of 1991 that triggered for allowing FDI in India. ⇒ Provision of the Foreign Exchange Regulation Act (FERA) were diluted to a great extent in this period. ⇒ India was heavily dependent on foreign exchange in the form of debts in 1970s & 1980s. But the 1991 crisis saw allowing a way to foreign exchange but which was non-debt-creating & long term in nature. 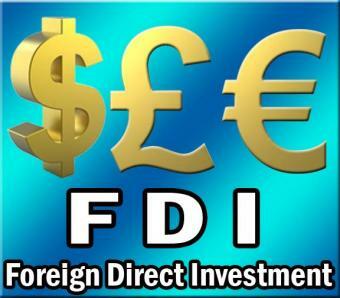 ⇒ FDI policy is now reviewed on a regular basis. ⇒ FDI can enter most sectors or activities under the Automatic Approval Route, except for a few sectors where there are additional restrictions on FDI such as equity caps, disinvestment conditions and lock-in periods on investment. Such restrictions are present because of the sectoral needs, security and strategic concerns and in the interest of domestic investment. ⇒ Industrial licensing has been abolished. ⇒ May sectors opened for foreign participation. ⇒ Many sectors were included in the sectors marked for automatic approval of FDI post 2000. ⇒ FERA was changes to Foreign Exchange Management Act (FEMA) in 1999 to facilitate foreign exchange management in the capital account. ⇒ Automatic permission for high technology agreements or technological collaborations in priority sectors and removal of conditions related to technology. ⇒ Reserve Bank of India (RBI) introduced an automatic approval channel for 100% foreign equity in priority sectors. The automatic route has been extended to up to 51% foreign equity in priority sectors. ⇒ Abolition of high local content requirements, dividend balancing requirements, and export obligation conditions except for 22 consumer goods. The conditions on 22 consumer goods were subsequently withdrawn in 2000. ⇒ Major institutions set up to promote and facilitate FDI inflows, such as Foreign Investment Promotion Board (FIPB), Foreign Investment Implementation Authority (FIAA), and Secretariat of Industrial Assistance (SIA). ⇒ Privatisation of public sector. ⇒ Aggressive signing of bilateral investment and double tax avoidance agreements to benefit and assure foreign investors. The law on trademarks and the Geographical Indications of Goods passed in 1999 to protect intellectual property rights. ⇒ Fiscal incentives such as tax subsidies and concessions offered by both central and state governments to foreign investment. ⇒ Reforms at the state government level and institutions established to help implement FDI projects. ⇒ Recent years have witnessed a slowdown in investment because of financial crisis, policy paralysis, and deterioration of business environment. ⇒ Various economic problems in India led to the sharp fall in the business confidence in India. ⇒ Because of this various sectors have been made open under FDI equity to regain the confidence of both domestic and foreign investors. ⇒ Allowing 100% FDI ownership in single brand retail trading and upto 51% FDI in multi brand retail. ⇒ Allowing foreign airlines upto 49% FDI. ⇒ Increasing FDI equity from 49% to 74% in certain broadcasting sectors. ⇒ Allow up to 49% FDI in power exchanges. ⇒ Increasing FDI limit from 26% to 49% in insurance sector. ⇒ Sectors such as asset reconstruction and telecommunications are eligible for 100% FDI upon approval by the FIPB. ⇒ The defence sector will also be eligible for greater FDI under the recent changes. For present it is 26%. But 100 equity is also allowed if the project are likely to result in access to modern and state of the art technology. ⇒ Increase in pension sector have been proposed and await parliamentary approval. ⇒ It will increase the efficiency of the concerned sector. ⇒ All the results of the current changes can be seen only in the future. ⇒ It will increase overall Indian economy. ⇒ It will facilitate better insurance products, technological capabilities, awareness efforts and expertise and skills in underwriting, actuarial, claims management and data standardization to India. ⇒ FDI inflow has increased in India in the past 20 years but it still lags behind (quantitatively) countries like China, Singapore or Brazil. ⇒ FDI inflow to India is concentrated in a few sectors only. ⇒ FDI has been seen to come in some states only. ⇒ Various problems that are in the way of FDI flow to India: 1) Infrastructure bottlenecks 2) rigid and complicated labour laws 3) lack of coordination between the centre and states 4) FDI caps/ceiling in many sectors where 100% FDI equity is not allowed for feasible investment projects and 5) difficult bureaucratic controls and procedures to get the necessary clearances and approvals. First time investors in India are always skeptical about whether projects will progress from screening to operation. ⇒ A better environment for infrastructure development with an appropriate institutional framework such as a dispute resolution mechanism, independent regulatory authority and special investment law. ⇒ A uniform labour code after an independent review and proper consultation with stakeholders. ⇒ Proper infrastructure connectivity to SEZs and allowing the private sector to provide infrastructure services to SEZs. ⇒ Increasing FDI caps in sectors with FDI potential and allowing more sectors under the automatic route. ⇒ Revisiting outdated laws, controls, regulatory systems, ad government monopolies affecting the investment environment. ⇒ Encouraging non-governmental facilitation services for foreign investors. ⇒ Further trade reforms and reforms in public services to attract foreign investment. In short, India needs to address its lack of adequate infrastructure, rigid labour laws, bureaucratic delays and state level reforms to realize its FDI potential. Which of the following is/are true about the recently (Oct 2013) launched 'High Speed Rail Corporation' project by the government? 1.To build resources for indigenously developing high speed rail coaches. 2.To develop high speed rail corridors in India. 3.It will build infrastructure for achieving higher speed trains in the range of 200 to 250 kmph.